This new year will quickly reveal to the American people whether some Democrats in Washington have resolved to abandon their overused—and unconstitutional—religious test for office. Two Democrats in the Senate, Sens. 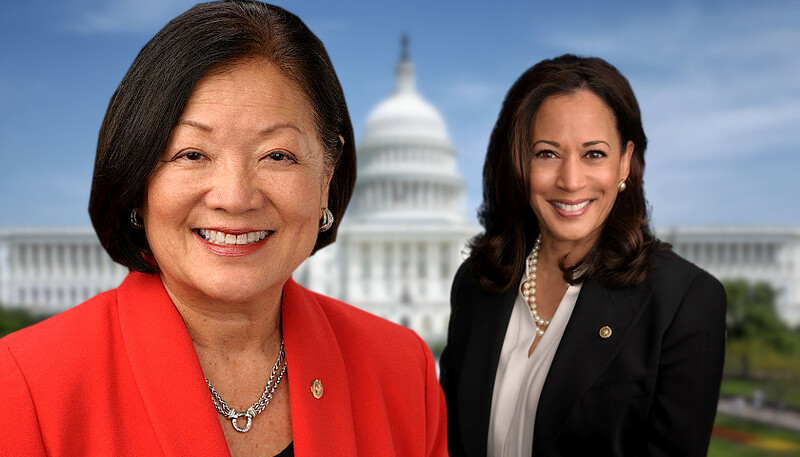 Mazie Hirono of Hawaii and Kamala Harris of California, recently objected to the nomination of Brian Buescher to a U.S. district court in Nebraska based on his membership in the Knights of Columbus, a Catholic fraternal organization. Their objections, premised on the organization’s affirmation of Catholic teaching, hearkens back to California Sen. Dianne Feinstein’s now-infamous criticism of the “dogma” of Judge Amy Coney Barrett and other Democratic senators who have vocally opposed religious nominees. These “extreme positions,” according to Hirono, should require Buescher to recuse himself from any future case related to the subject matter. Harris, employing the two most formidable weapons in the progressive arsenal—ignorance and audacity—asked Buescher if he was aware that the Knights of Columbus opposed abortion when he joined. Catholics, Protestants, and others without any religious affiliation recoiled at the sight of a U.S. senator questioning a nominee’s fitness to serve based on the “dogma” of a particular religion. In spite of what some view as Feinstein’s violation of Article VI of the Constitution, Barrett was confirmed by the full Senate with a vote of 55-43, including three Democrats voting in favor. Apparently this did not serve as the much-needed reminder of our Constitution’s prohibition of religious tests for public office. Hirono and Harris picked up precisely where Feinstein left off. Beyond their typical disregard for the primacy of religious liberty in the Bill of Rights and the explicit restraints and limitations placed on our government by the Constitution, these incidents demonstrate the radical left’s notion of an ideal religion—one that is confined to the minds and pews of adherents on Sunday and shunned from the life of the nation the rest of the week. It is debatable whether a devout Catholic like John F. Kennedy would be welcome in today’s Democratic Party. One similarly devout Catholic, Rep. Dan Lipinski, D-Ill., holds strongly to his church’s teaching on abortion, and as a result has found himself pushed to the fringes of his own party on the issue. If a neutered and liberalized religion is the only sort of religion the Democratic ruling class in Washington is comfortable with, it’s easy to see why people like Justice Brett Kavanaugh, Barrett, and Buescher make them so uncomfortable. Moreover, if one sees the judiciary as an unelected super-legislature responsible for making policy from the bench—as so many on the left do—a judicial nominee’s belief system becomes fair game. But Buescher’s response to Harris’ unconstitutional line of questioning was as humble as it was correct: Judges don’t enforce their personal beliefs, they enforce the law. Leftists like Harris and Hirono don’t think that is possible, and if a devout Catholic isn’t willing to subvert his faith to the political orthodoxy of the day, then he or she must not be allowed to serve. If that means establishing a religious test for office in direct contradiction to the Constitution, so be it. For over 200 years, the Constitution has stood as a bulwark against government intrusion into religious matters. Jurists who strictly adhere to the text of the Constitution and the proper role of the judiciary are essential to the preservation of our liberty. This, in turn, places an enormous responsibility on the president and the Senate when it comes to filling judicial vacancies. Evaluating a nominee should include a number of closely scrutinized qualifications—but religion isn’t one of them. Lathan Watts is director of community relations for First Liberty Institute, a nationwide religious liberty law firm dedicated to protecting religious liberty for all.